Happy Top Ten Tuesday! Today I’ve got 10 Life Changing Beauty Hacks you need to know. Seriously, these will make life easier for you, I swear! I’m sure you already know things like don’t wash your hair every day so that your hair is healthier (unless your hair is extremely oily) or that you can use dry shampoo to add volume to your hair in a pinch. Hairspray spritzed on your finger tips can work to groom your brows. Don’t miss out on the awesome 2018 Memorial Day Sales! This post contains a mix of press samples and purchased by me. If you have dry skin, like I do, it can be hard to wear powder foundation and liquid foundation can be prone to caking or accentuating dry areas. Add a drop of Paula’s Choice Hyaluronic Acid Booster (or Josie Maran Argan Oil Light or Cover FX Infusion Drops) to your liquid foundation to help it apply seamlessly and blend flawlessly with your skin. Spritz with UD’s All Nighter or Chill setting spray to stay gorgeous all day. A good drugstore option would be the Nyx Dewy Spray. I apply with a damp beauty blender. You need the best cleansers for dry skin! For concealing undereye darkness, I use Urban Decay Naked Skin Concealer in Fair Neutral and dot it under the eyes. Then I use my damp beauty blender to blend it out. I apply my liquid foundation (as described above). Then, very sparingly, I apply setting powder also with the damp beauty blender, patting. 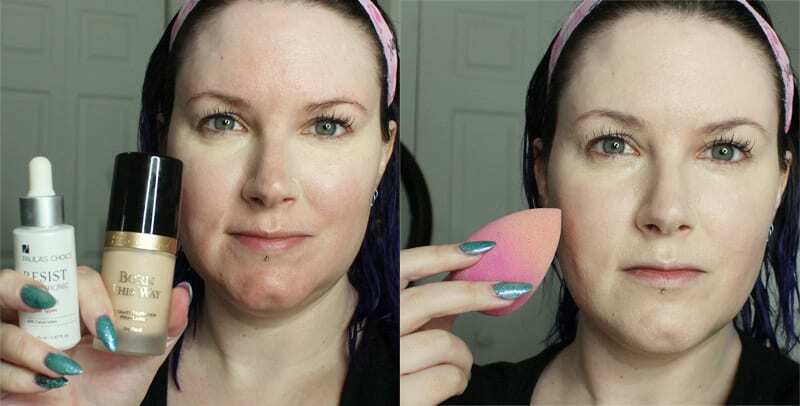 If you don’t like the beauty blender, use a makeup puff and gently pat and roll with the puff to set. I find this works best with tarte Smooth Operator pressed finishing powder in Fair or NARS light reflecting loose setting powder. A great indie option would be the Lunatick Cosmetic Labs HD microfinish powder. I’ve found the beauty blender keeps it from creasing or caking. Find a new favorite concealer in the Pale Girl’s Guide to Concealers! Looking into a mirror, take a long makeup brush and roll it up and down horizontally on your cheek. When you feel it fit under your cheekbone, that’s the hollow of your cheek. 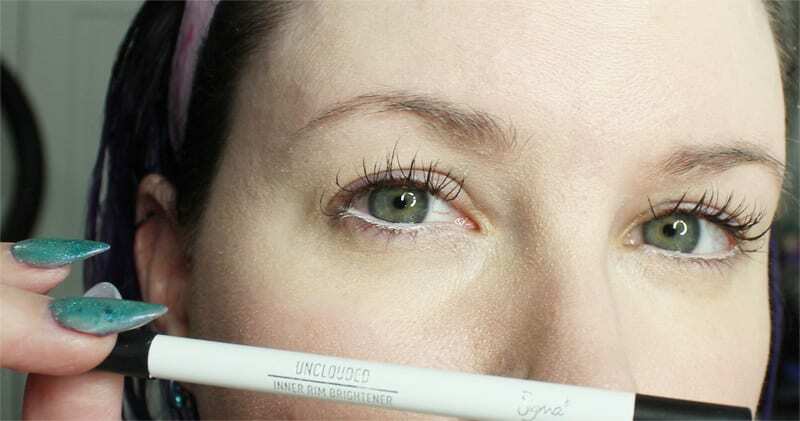 Now line the brush vertically with the end of your brow. Your contour should not go any further in on your face than the end of your brow. 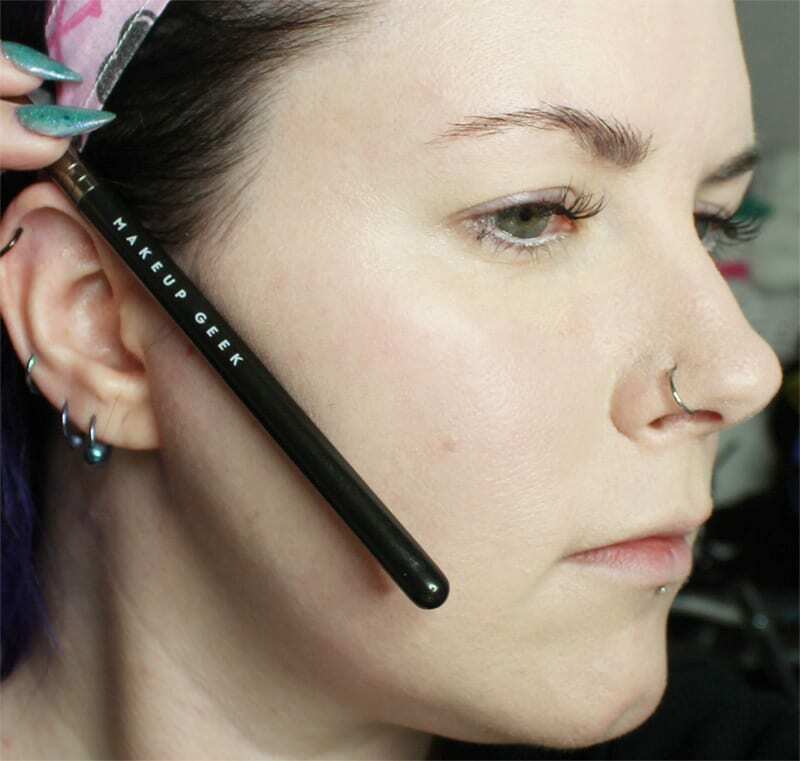 That’s where you want to apply your contour and then blend back towards your ear and hairline. My favorite contouring brush is the Makeup Geek Chiseled Cheek Brush. Learn all about contouring in the Pale Girl’s Guide to Contouring. Building from the contour hack, take 2 fingers and lay them to the side of your nose. 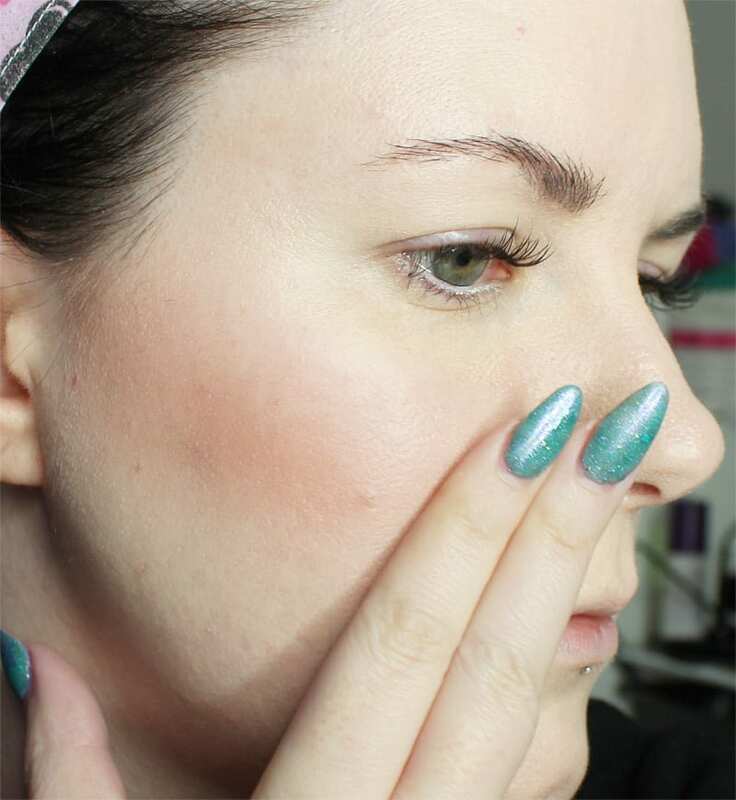 Your blush shouldn’t go in any further than those 2 fingers and it should be above the hollow of your cheek. Look more awake by using a white or light beige eye pencil on your lower waterline. Above I’m using Sigma Unclouded. You can help this effect a bit by adding a light shimmery shade to your inner lid. Use a pointed q-tip to clean up lipstick mistakes around the edge of your lips. You can also use a pointed q-tip with a bit of makeup remover to clean up any eyeliner mishaps. Bonus – q-tips can be used to smoke out an eyeliner pencil or to blend eyeshadow. Use coconut oil on a q-tip to gently exfoliate and moisturize your lips before applying a lipstick. You’ll still want to apply a lip balm or lip primer after you do this, but your lips will be soft and smooth, as it’s better than using a sugar scrub. Use coconut oil to remove your long wearing matte lipsticks. They’ll come off easily. Bonus – this works well to remove waterproof makeup, mascara, eyeliner, and foundation. And it’s inexpensive! In between applying your first and second coat of mascara, take a makeup brush and dust a translucent setting powder (or baby powder, whatever you’re comfortable with) onto your lashes. I like e.l.f. HD Setting Powder. If your manicure is chipped or grown out and you don’t have time to completely redo it, grab a glitter or flakie top coat (I like KBShimmer She’s Beyond Kelp or GlitterDaze Delphinium (H) right now) and put that on your nails. Then finish with a fast dry top coat. You can use Elmer’s Glue on a pointed q-tip to apply a nail polish shield to your cuticles before you paint them. Once you’re done, you can just peel off the glue. 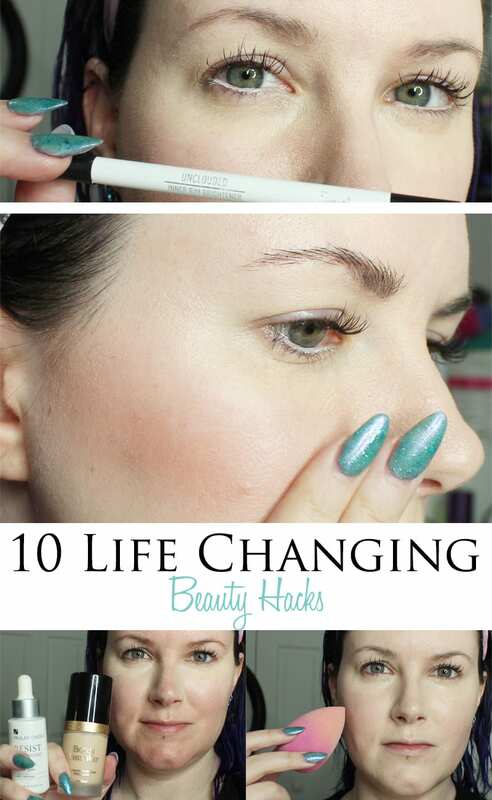 Make sure you check out 11 More Life Changing Beauty Hacks! You have a ton of great tips! I really liked them. But did you know that if you want correct your makeup during an application, you can take a q-tip with any primer and fix the area where your mistake was made? Thank you so much for sharing! Glad you find it helpful. This is a great post! Thank you for sharing all these tips! These are beyond amazing, THANKS!!!!!!! 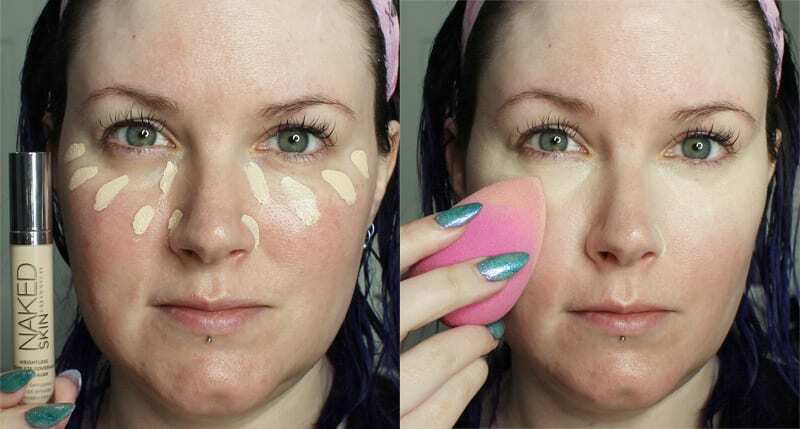 on #2 how you apply the concealer does make a difference, I use Immaculate Chantilly and it’s denser, do you think it would still work the same way? I do the triangle hack right now(which was life changing, but this takes it to the next level yay! I think applying with a damp BB will be great) And then I set with a brush, Goss #2 with NARS Velvet Loose, but definitely will to try rolling it and pressing with the BB!! LOVEEEE Contour Hack, that was one I was Qing about! 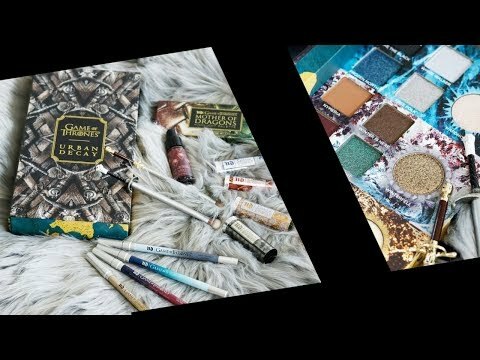 Question on #9 what brush would you suggest applying the powder with? I’m lash obsessed so that’s awesome Thanks! For #9 I would use a fluffy brush to gently dust the lashes. My daughter taught me the fake awake hack and I didn’t know if it really worked so I’m glad to see that you think so. I really like the fake awake hack! I never thought of that one- it really does work though! I’m going to put some of these hacks to use! Thanks so much for sharing! The Paula’s Choice Hyaluronic Acid booster is really helping my dry skin woes. Some of these hacks I already knew, but not all – love the Elmer’s Glue tip! Glitter solves a multitude of problems! Glitter my life..
Loving your lashes – while I know that’s not the focus of this post – I couldn’t help but notice them the whole time I was reading. I want lash extensions but since I oil cleanse, the lady here said it’s not suggested as it will take off the adhesive. :/ Great hack tips… lots of good ones. Thank you! Yes, I avoid coconut oil near my eyes. I use micellar water or coconut oil on my face. My spa sells special makeup remover for the lashes / eyes so I use that. Ah this post is amazing – Great hack tips! Great hacks! The Elmer’s Glue one is very clever. I wish I had known about it sooner! These tips are awesome! What a fantastic and well articulated post. Looking forward to using these tips in the future. The brush one makes so much sense! I adore my Beauty Blender. I need to try the powder/mascara hack. I’ve read about it but never did it. Great hacks. I agree with the Beauty Blender, it is surprisingly amazing when used under eyes and very wet on application. I love the beauty blender, it’s great for keeping my makeup from caking. Love the flesh colored liner trick–it work so well! It really does help a ton. This is a great list of tips and tricks. I’ve never added anything to my foundation to help it or my skin – that’s such a good tip! I also just started using coconut oil to remove makeup. It’s so amazing! AND, it smells good too, haha! I love coconut oil so much! Loving that baby powder on the lashes trick. Oh those tips! Love love them!! Saving this for sure! The Elmer’s glue trick is genius! I feel your pain. I often have skipped blush in the past because I was afraid of looking like a clown. It’s a really nice powder!